Thanks to Karla Zimonja for giving me the original inspiration to design this. A Diplocaulus is a primitive amphibian that lived in the Permian period, roughly 250-300 million years ago. It could be up to about a meter long. 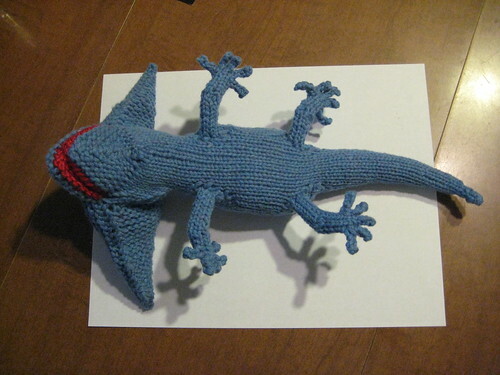 There seem to be a bunch of different ideas regarding exactly what it looked like; I took the liberty of basing my knitted one on some of the cuter versions. 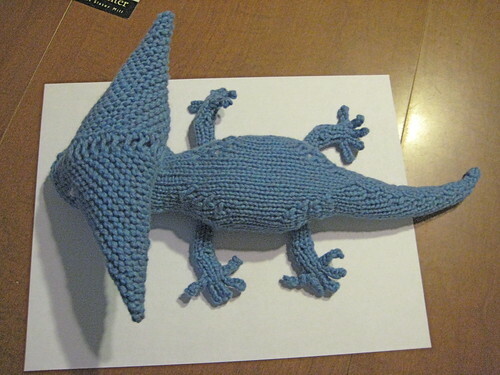 Roughly 100 yards of yarn in the color you've picked for your Diplocaulus. Any bulky or worsted weight yarn should be fine. 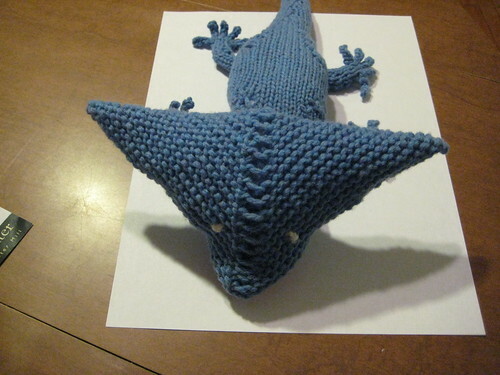 Roughly 30 yards of yarn in the color you've picked for its mouth. A scrap of yarn for the eyes. Poly fill to stuff the body and head. 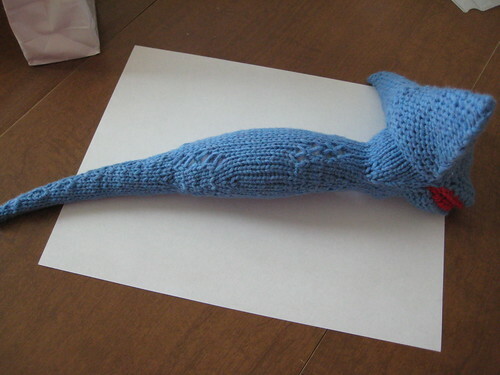 A tapestry needle to sew things together and embroider the eyes. K30, place marker, K2tog, K to end. K to mark, K2tog, K to end. 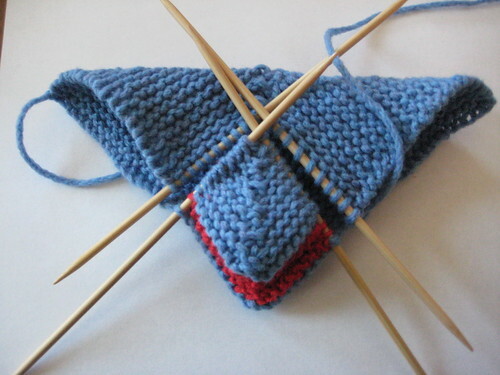 Repeat until 20 stitches remain, 10 on each side of the marker. 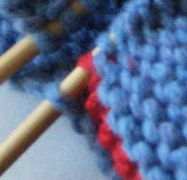 Place remaining stitches on stitch holders, removing marker. The 'K2tog's should all more or less line up. 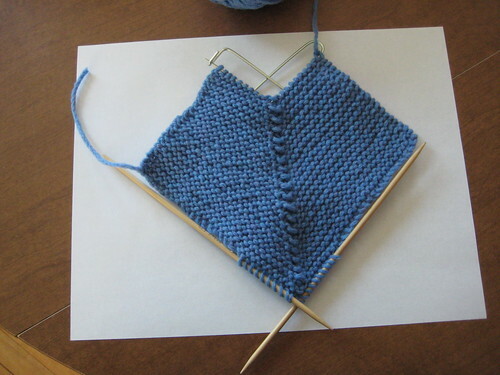 Continue until 1 stitch remains and bind off. and repeat the above using the mouth color. 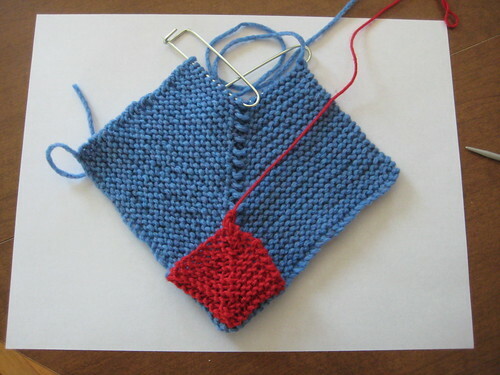 Pick up 10 stitches along the free edges of the square just knit and repeat one last time, this time in the body color. 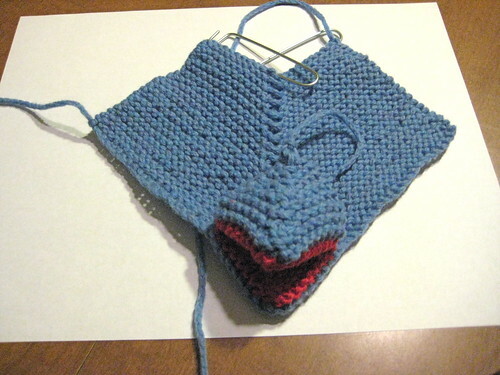 On each side of the mouth (using a separate DPN for each), pick up one stitch each from the top lip and inside of the mouth, then ten stitches from the free edges of the square just knit. 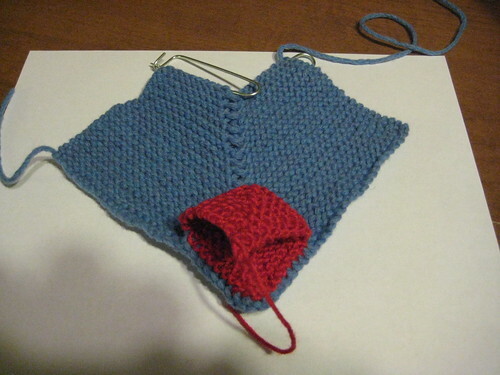 Move the stitches from the top of the head that are currently on stitch markers back to DPNs (10 stitches per DPN). 12 stitches on the left front DPN (from the mouth). 10 stitches on the left back DPN (from the top of the head). 10 stitches on the right back DPN (from the top of the head). 12 stitches on the right front DPN (from the mouth). 44 stitches total. You will work the stitches in that order. 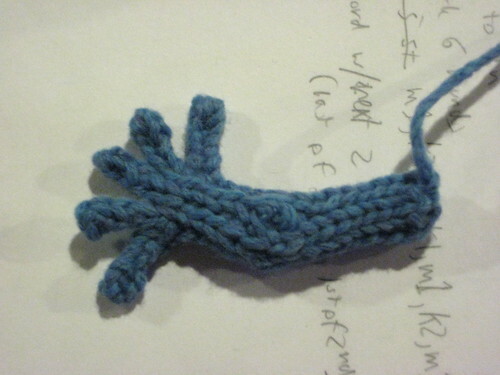 Knit 3 rounds. 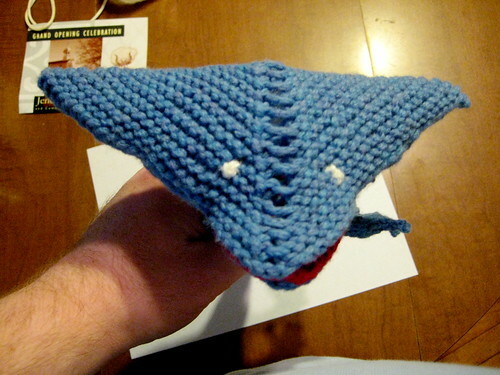 Leave yarn on DPNs, sew up the sides of the head, and insert stuffing. Concentrate the stuffing on the center of the head and use just enough to give it a little interior support; the head's structure should be relatively stiff, so it shouldn't be necessary to really pack the stuffing in. Throughout this section of the pattern, you should stop every 5-10 rows to stuff the section you've just knit. The 'K2tog's should line up. 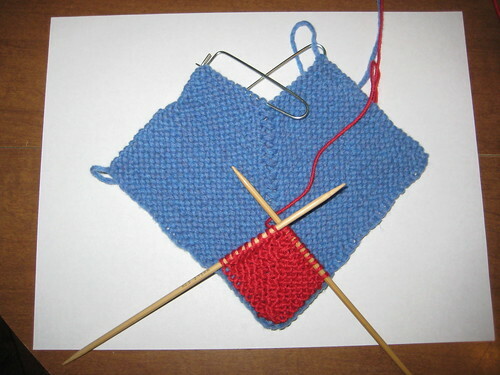 Continue in this way until 3 stitches remain, stuffing as you go. 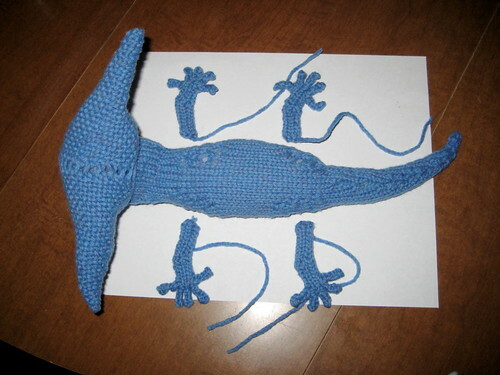 Break yarn, pass through remaining stitches, and work the yarn ends into the interior of the diplocaulus. 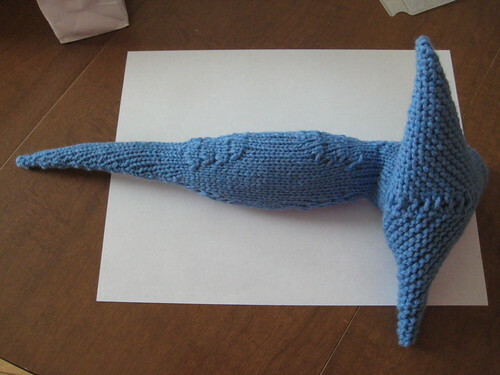 Leaving a 6-8 inch tail of yarn (which will later be used to sew the leg onto the Diplocaulus body), cast on 6 stitches and work in the round for 8 rows. 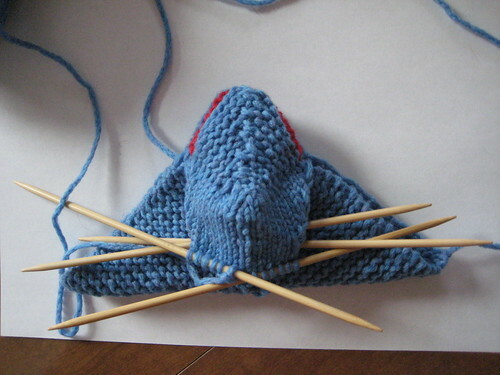 There should now be one stitch remaining in the round (for a total of ten stitches). 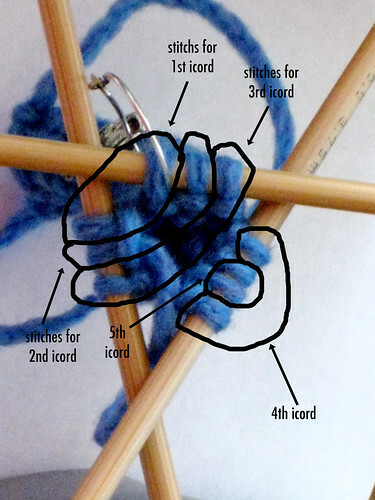 Using this stitch and the first stitch of the next round, work as 2-stitch icord for five rounds, then break off yarn and pass yarn through the two icord stitches. Continue in this way, creating 2-stitch icords using stitches from the beginning and end of the round, until you have created five icords. It is not necessary to put any stuffing in the legs. Sew legs onto body as shown. The top of the legs should be slightly below the line of 'Kfb's and 'K2tog's in the body. Work in ends. Embroider eyes. 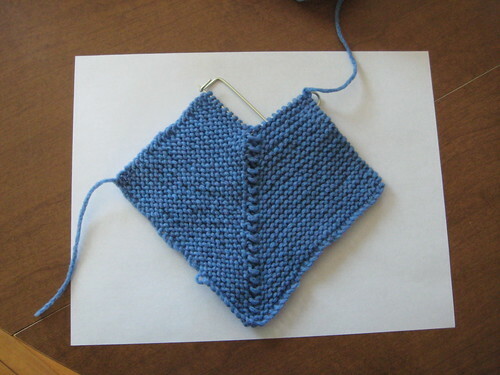 If different-sized head is desired, feel free to increase or decrease the number of stitches cast on in the 'HEAD' section of the pattern as desired. You must cast on at least 40 stitches in order for the pattern to work, but other than that there's no limit on the number of stitches used, as long as you use an even number of stitches. K30, place marker, K2tog, K to end. 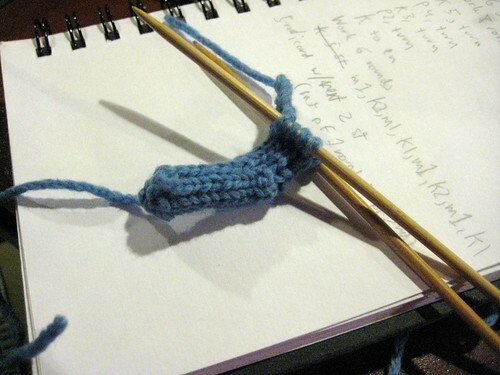 -- change '30' to half of the number of stitches you cast on. As always, if you have any questions or comments, please let me know! 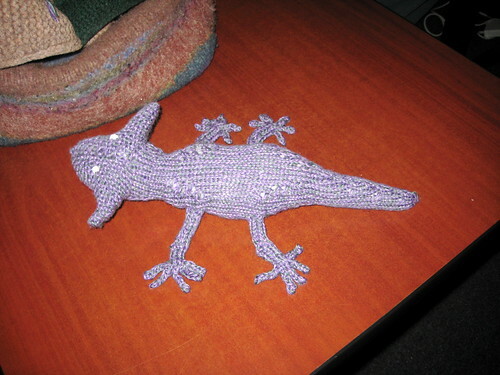 Click here to see this pattern's Ravelry page.